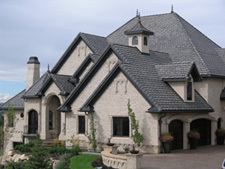 ProTech Roofing is a 3rd generation, family-owned roofing company in Centerville, Utah, performing tile roof installation with superior craftsmanship for more than 70 years. We only use Bartile roofing materials because they make the difference between ordinary and extraordinary. Energy efficient, environmentally friendly, highly customizable and backed by a 75-year warranty, Bartile tile roofs installed by ProTech Roofing are built to last, efficiently protecting your home for the better part of a century while boosting curb appeal and increasing the value of your home or business. For a FREE tile roof inspection, or to schedule a quote for tile roof installation in northern Utah or southern Idaho, call ProTech Roofing at (801) 691-7720 today! Whether you own a home, apartment complex, warehouse or other commercial building, ProTech Roofing offers energy efficient tile roofing to save you money. Every roof we install is incombustible, highly hail-resistant, and can stand up to winds up to 120 mph. It's not uncommon for tile roofs to last 100 years or more, so forget reroofing with cheap composition shingles every 20 years, and install a beautiful, lifetime tile roofing system to protect your home or business for generations. These are just a handful of styles that are available in over 700 colors and textures. You can fully customize your new roof to match your home and stand out as the crown of the neighborhood! And a commercial tile roof installation saves your business money over the long term by lowering energy costs associated with heating and cooling, as well as avoiding frequent roof replacement. Whether you're in Idaho Falls, Twin Falls, Ogden, Salt Lake City, Provo or Springville, ProTech Roofing has you covered with extraordinary tile roof installation backed by a 75-year guarantee. Call ProTech Roofing today at (801) 691-7720 to learn more, or to schedule a free inspection and roofing quote.